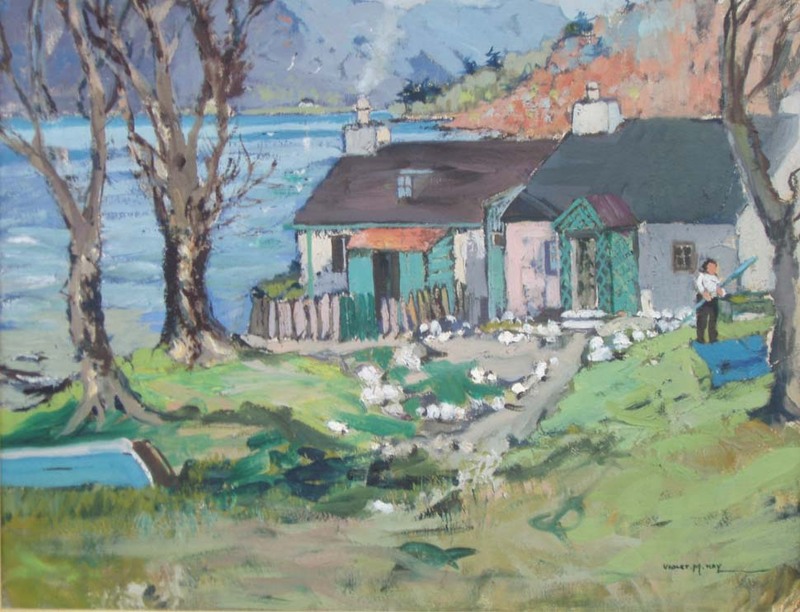 ONE of the paintings owned by the Anderson Trust and currently on show in Helensburgh Library is the work of a distinguished artist who lived in Portincaple and is buried at Faslane Cemetery. 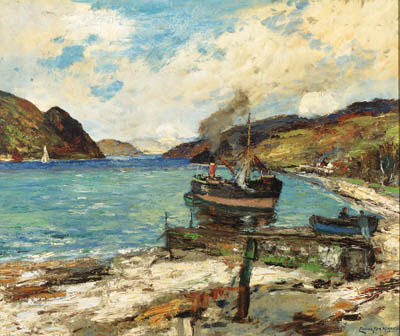 Best known for his paintings of harbours and Clyde scenes, James Kay RSA RSW was born in Lamlash on the Isle of Arran on October 22 1858, but lived for some 33 years in the Loch Longside village in a house called Crimea (below right) and worked in a studio at 79 West Regent Street, Glasgow. His great niece, Jennie Kettlewell, who lives in the London area, believes that Crimea — now renamed Dalriada — actually belonged to his brother Alec, a shipping office manager. The name was chosen when they moved there in 1909 because his father was a Chief Petty Officer in the Royal Navy at the time of the Crimean War, serving in the Black Sea area, and later was stationed at Lamlash. James painted an elaborate mural of scenes from the Crimean War on the walls of the main entrance to the house. Her great grandmother was housekeeper for Alec after her husband died, and during that period James met and married in 1911 the much younger Ada Laval from the Island of Mauritius in the Indian Ocean. 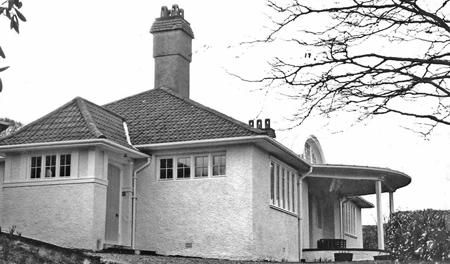 Local historian Alistair McIntyre said: “I passed the entrance many times in my childhood. Although James Kay passed away at Crimea on September 26 1942, I can remember his widow and his daughter Violet. They used to travel frequently on the train, as there was a station at Whistlefield. James Kay narrowly escaped being born in a revenue cutter at sea. His boyhood was spent in Arran, where ships and the sea were his life, and the smell of tarry ropes got into his blood. Like so many of the other distinguished West of Scotland painters of that era, he was a student at Glasgow School of Art. He also studied closely from nature, and developed early a distinct and colourful method of his own. Before devoting himself entirely to painting, he spent some time working in a Glasgow insurance office, and joined the St Mungo Art Club where James Guthrie was a fellow member. He shared studios at first with two other young artists, Stuart Park and David Gauld, and delighted in studying the river Clyde in all its aspects. He was not one of the famous ‘Glasgow Boys’, although he was friendly with some of them, including Guthrie, George Henry, and A.E.Walton. His first picture in the Royal Academy was 'Towed into Harbour on the Clyde', hung in 1889 and then bought by an English collector, and his first in the Paris Salon was in 1894. From then he had works on display in most of the important exhibitions in Britain, Europe and America every year. In 1903 his canvas, ‘Toil and Grime’, a picture of shipping at the mouth of the River Kelvin, was awarded the silver medal and diploma of the Société des Amis des Arts at Rouen in France. The same year his ‘River of the North’, a winter scene in Glasgow’s busy harbour, gained the highest honour a foreign artist can receive at the hands of the Salon jury and of France when it was awarded a gold medal, and was purchased for the Luxembourg collection. 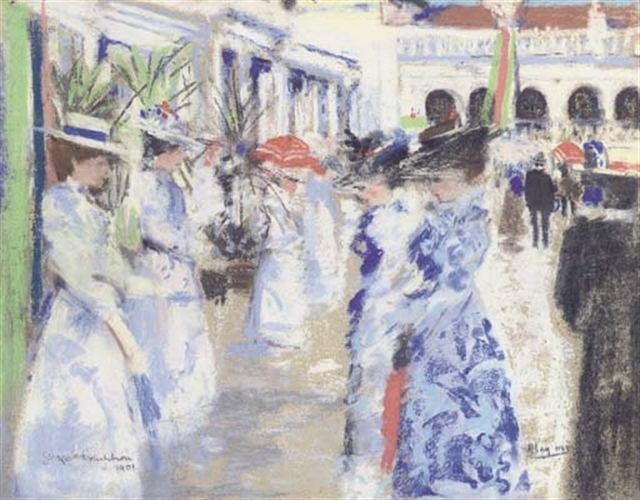 In 1906, he won the gold medal and diploma at the 37th Exposition Municipale des Beaux Arts de Rouen, where his picture ‘Winter’ was purchased for the Rouen Municipal Collection. The following year his ‘Launch of the Lusitania’ in the Royal Glasgow Institute of the Fine Arts was bought by the Corporation of Glasgow for the municipal collection. His subjects were wider than just the Clyde and shipping. He painted Glasgow city scenes and some of the Thames, and still farther afield, in pictures like ‘The Armada’ and ‘The Revenge’ which embody the sea romance of Elizabethan days, and in France, where he spent a lot of time, and Holland. 'Clyde Nocturne', a study of the Broomielaw, hangs in the National Gallery in Wellington, New Zealand. He often worked in a distinctive mix of pastel, gouache and watercolour, though latterly he concentrated on pure oil and watercolour. 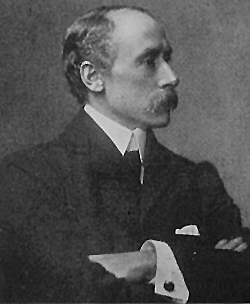 He was a member of Glasgow Art Club in Bath Street, the United Arts Club in London, the Royal Glasgow Institute of the Fine Arts, and the Royal Scottish Society of Painters in Water Colours — eventually becoming its senior vice-president. He was elected an Associate of the Royal Scottish Academy on March 29 1933, and five years later was elected an Academician. His and Ada’s only child, Violet McNeish Kay, was born in 1914 and died in 1971. She also became an accomplished painter, and two of her works, ‘A Fresh Day, Portincaple’ and ‘Winter Morning Loch Long, Portincaple', look down on Crimea at different times of year — both are also in the Anderson Trust collection. Violet is remembered well by a very well known Helensburgh resident, Norah Dunn, who now lives in Kilbirnie, Ayrshire. Mrs Dunn said: “I was friendly with Violet and we were in the same class at St Bride’s (now Lomond) School. “The frontage of the bungalow Crimea has now been altered, but formerly, when you walked up the steps and entered the hallway, you were confronted with the whole wall ahead which was a mural painting of the Crimean War painted by James Kay. “It was a wonderful painting — but dark and sinister — with soldiers and horses being attacked and shot at and killed! It was quite frightening. “I did not know James Kay, but after his death Mrs Kay and Violet moved to Colgrain for some years. “After Mrs Kay’s death my friendship with Violet continued. She was a good, recognised painter in her own right, but she was a lonely person with no relatives. “After her death the lawyer asked for our help in clearing out the house. He took all the paintings to Glasgow to put them up for sale. The painting above left is 'Head of Loch Long' by James Kay, above right is 'A Fresh Day, Portincaple' by Violet McNeish Kay, and below left is 'Glasgow Exhibition 1901' by James Kay. The photo of Crimea is by Mary-Jane Selwood of the Anderson Trust.